State-of-the-art digital audio playback device designed to provide a continuous-play audio source for message-on-hold, background music, or any other audio application where high-quality audio playback is required. Messages are stored on industry standard USB flash drives from 16MB up to 4GB. The Messager USB is capable of MP3 file playback from 8Kbps all the way up to full CD-quality audio playback of 128Kbps. Audio content is easily managed by plugging the USB flash drive into a PC or MAC computer’s USB port and “dragging and dropping” MP3 files to and from the drive. Your customers can receive new and updated message-on-hold or background music programs via e-mail or ftp and update the units themselves saving you the expense of additional USB flash drives and the related mailing and tracking costs. 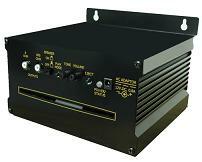 Digital audio playback device used for music and message on-hold applications. Features advanced Slot Load CD drive downloads audio files from a standard audio CD to digital flash memory. FeaturesNEW Slot Load CD Drive Familiar to anyone that listens to CD's in their automobile! The new Slot Load system will provide a recognized interface for customers to insert their CD audio production. Slot Load technology also eliminates the wear and tear that can occur over time with CD "tray" style drives. Standard CD Format Ensures a common CD format is used and will help eliminate confusion for both production and studio and end-user customers. Aluminum Enclosure For environments where durability and rugged construction are key. Tone Control The tone control provides added flexibility to adjust the bass and treble to a desired level on each phone system. Internal Speaker The internal speaker adds the ability to listen to the audio production and prompts. The speaker's volume and tone are at a fixed level, and can be turned on or off. Flash Memory All audio storage and playback are from digital flash memory. This allows the player to retain its audio production during a power outage, and automatically resume playback when power returns. Easy Install Visible wall mount flanges ensure a quick and easy installation in the phone room. RCA/RCA and RCA/mini cords are included to allow a plug-and-play application. Multi-Track Up to 16 audio tracks can be burned to a CD for future playback. Individual tracks can be selected for download as desired. Audio tracks are stored to memory one at a time.